Since I have a shopping addiction, I have tried very hard to keep my spending in check for our art room redo. 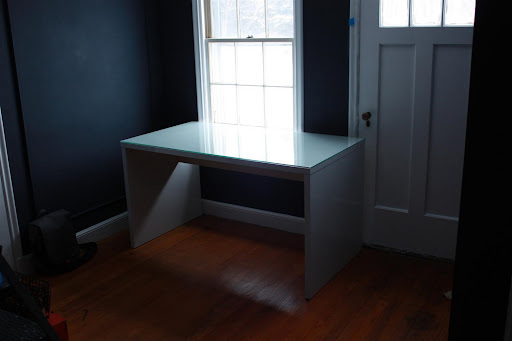 It wasn't too hard since this room could only hold one piece of furniture...but I didn't even want to pay for the piece we needed, which was a large desk or table. I found a perfect (almost free) solution when I looked into this little-used room on our first floor. We call it the 'office,' but do not do any sort of office work in there. In fact, the only ones who work in there are the cats. They work on beating their records for smelliest turds. Honestly, there is no good solution for cat poo, is there? NOT CUTE. While the light wood-look was hot when I purchased the office set 7 years ago, it is definitely not anymore. 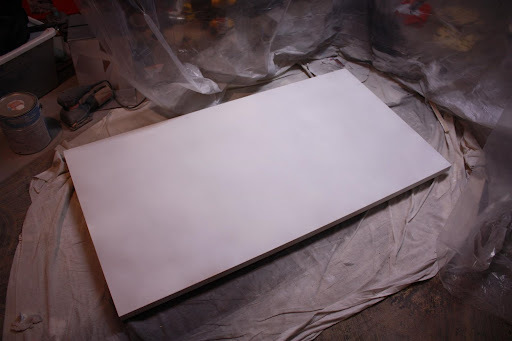 So, I decided to paint it high-gloss white. I took it apart and brought it downstairs to my 'kill room'...where I spray paint things with Dexter. And then I finally took off the IKEA sticker. Because I probably won't return it now. I gave everything a good sanding. 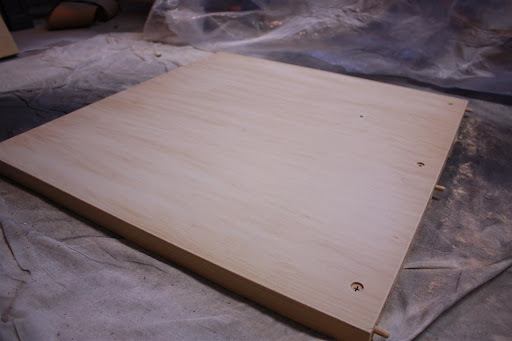 Well, as good as you can sand without removing any of the dowels or Ikea hardware. Yeah, sometimes I'm LAZY. 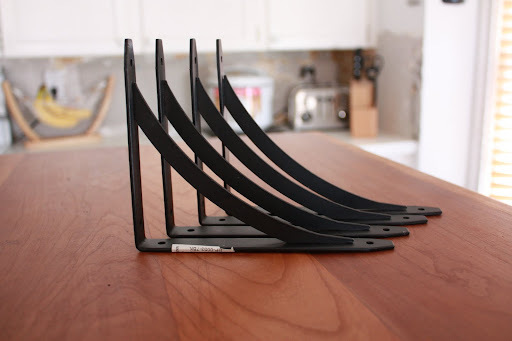 I sanded the laminate until I had pretty impressive piles of dust all around the pieces. 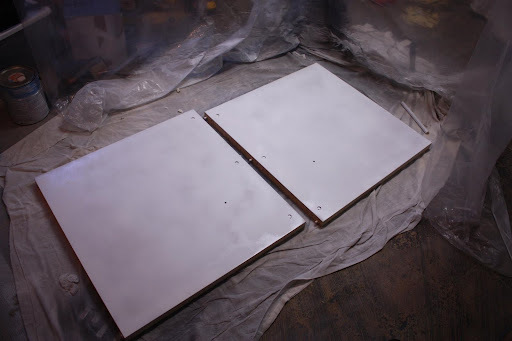 Then I sprayed everything with a great oil-based primer, Cover Stain. 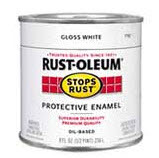 I usually roll or brush on BIN primer for wood/laminate, but I saw a fantastic deal on Cover Stain cans at my local BM store, so I picked that up instead. It works well and I'm LAZY. Plus, I have a kill room. Duh! The choice is obvious. 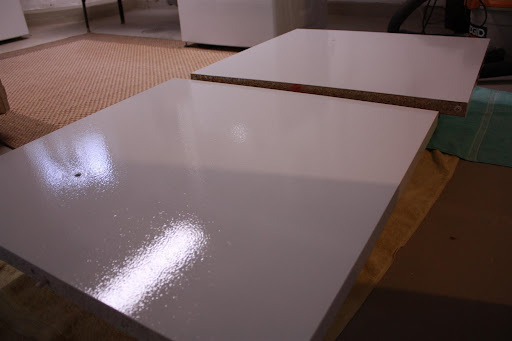 I sanded any rough spots after the primer dried, and then busted out the sticky, messy and stanky Rustoleum Oil-Based enamel in Gloss White. 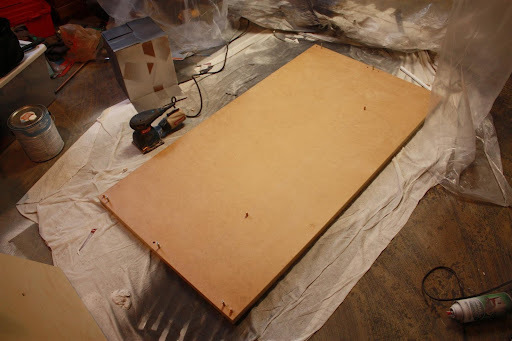 I knew oil-based would work better on laminate than water-based, and I wanted a nice candy-shell finish on the desk, but OH MOTHER it is such a pain. On the plus side, you get a little 'high' from it. So that's cool. I'm kidding. Sort of. Whatever you do, do NOT apply this paint with a nap roller! I had little fuzzies everywhere, for some reason dust, dirt, hair, boogers, anything in the air is attracted to this paint like a magnet. And it takes 24 hours to dry. Booooo! I sanded the first coat of paint to get off all the little fuzzies, then wisely decided to give the nappy roller another shot. I am dumb. Needless to say, the same thing happened and I just don't care anymore. It will remain fuzzy. And you can totally see it. At least the top has glass, so that helps a little. 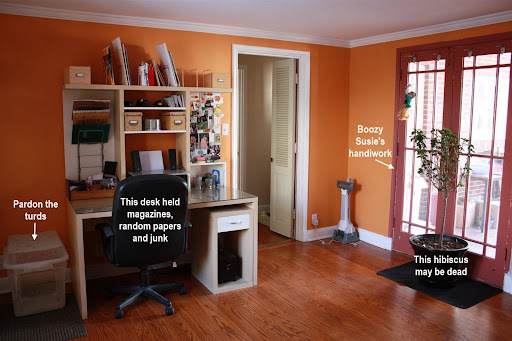 Fuzzies or not, it is much improved, and definitely serves it's purpose for the room. 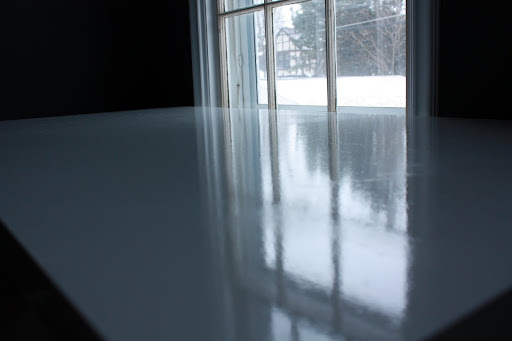 Side note: there is another part of the desk that I also painted, but used a foam roller instead of nap. It worked oodles better. It looks so much better white! And it only cost me about $13 in paint and primer. I will have it all posted by Friday! In the meantime, happy Hump Day! This post couldn't have come at a better time! 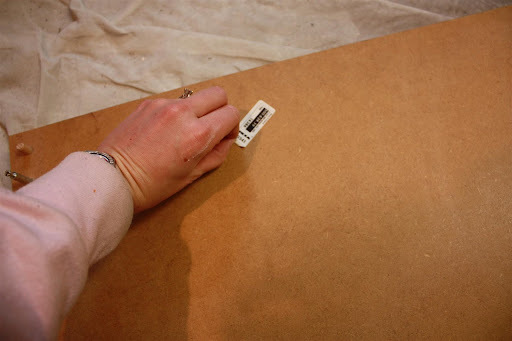 I have an Ikea table with a similar use-to-be-hot light wood finish in dire need of a new coat. I will definitely be referring back to this post for tips. Oh and your kill room is hot. I'm excited about the reveal on Friday! Woohoo! Hey, you could not possibly be as lazy as I am, so don't feel bad. I wouldn't have even taken it apart to paint it. At least you did that. I love it white, BTW! I love hearing I'm not the only lazy one sometimes! (And for the record, I probably wouldn't have taken it apart, either!) :) WHY did we all think that light IKEA color was awesome a few years ago?! I've got a few pieces myself in major need of a fresh coat of SOMETHING! I love where your room is going - can't wait for the big reveal! You mock me with your ability to find the perfect colors for your rooms. Cute fabric. And I've hunted all over overstock for that rug. Did you take the last one? I need to replace ours since we took it outside to clean when the dogs barfed on it, and then it promptly was rained on....for four days. Anyway--can you share a link? Aaaaannnnnd - love the boozy suzy comments. Love the white. Looks great (regardless of fuzzies). 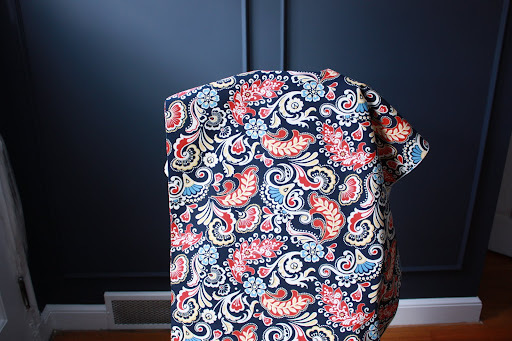 Love love love the fabric you chose. Totally lovely. We don't do any "work" in our office either, probably because we both have laptops and are big couch potatoes, sooo.... yeah. Anyway, I thought your painting story was quite humorous. The white was a good choice. And yes, cat poo is not an easy odor to cover up. Although I'm sick of having an unfinished basement, at least it's a good place for the litter box! 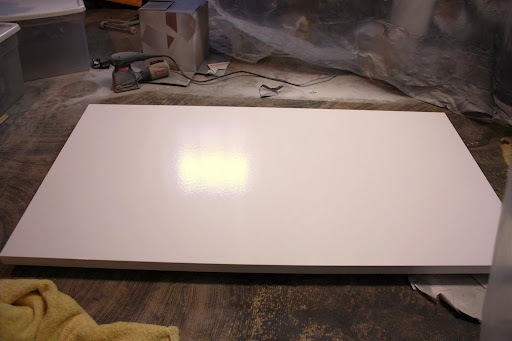 MMMMM.... love that shiny white paint! 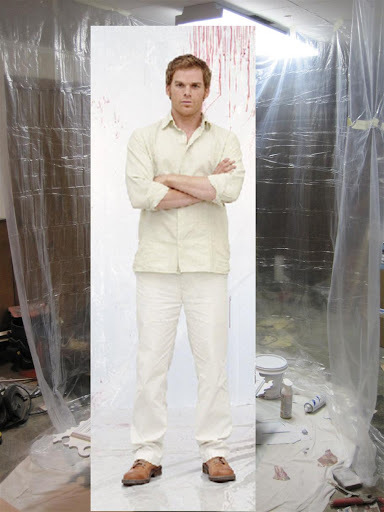 The "kill room" made me laugh - love Dexter!! I love your fabric, just love it! I can't wait to see the room completed. O you tease! :-P I was hoping these were the updated pictures of the art room. I love the fabric by the way. Anyway, it looks so much better. And doesn't something always seem to pop up with projects that keeps it from being absolutely perfect? Just tell people the fuzzies were intentional. You were adding in some texture! Oona, I only took it apart because I knew it wouldn't fit up the stairway! It is 56 inches long, so it had to come apart.....otherwise, I would NOT have done it! I actually didn't know you could even paint laminate, so I'm glad you posted this. I always walk by things at the DI (the Utah version of Goodwill) then keep walking when I realize it's laminate because I didn't think it was possible to revive with paint. Duh! Glad the spray primer worked. I'm lazy too! 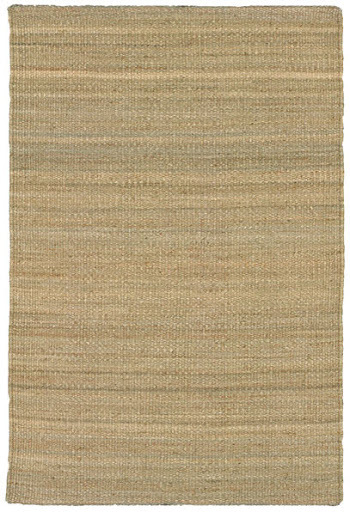 Oh and I have a question about the jute rug. I love how it looks, but is it scratchy? Like, could you lie on the floor writing in your journal teenage-angst style? lol - agree, I had a bunch of the used to be oh so hot light wood furniture - I'm in the process of repainting some of it! Amanda - the rug is suprisingly soft for jute. I got a rubber rug pad from TJ Maxx for underneath, and I think that it could be squishy enough to support your angsty-journaling habit! Mrs. Chic - you're right, it would look just like a Parsons desk if there were legs instead of full sides. 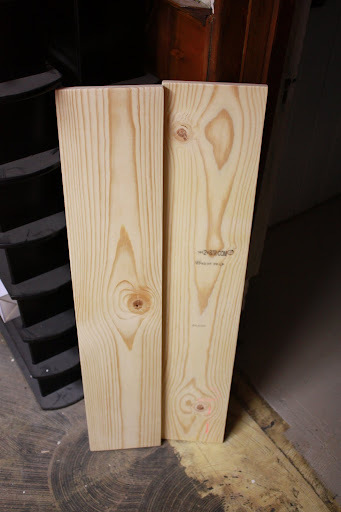 I definitely have a couple more pieces from the IKEA "blonde wood" series to take my (foam) roller to! Can't wait to see what you come up with - I work from home and am constantly struggling with a functional, practical, design friendly office! You did a fab job on that desk! And you aren't lazy...you sanded it for pete's sake!! 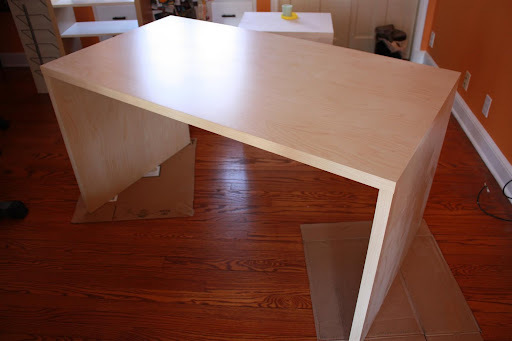 Do you think you could do the same process to one of those laminate/particle board cheapie Target desks? Really enjoy your blog! Maybe one day I'll stop 'anonymously' stalking all of them! What a stunning home. I love your look. I will be attempting many IKEA paint jobs as well over the next few months. I'm just starting my redecorating of our 50's bungalow, and am looking for inspiration. I will definitely be back to check out your blog for great ideas! Stop by if you have the time over the next while. I need all the help I can get!